Mini Golf Tees Off on iPhone | OhGizmo! Mini Golf is one of those games that can be intensely frustrating for many reasons. For me I get frustrated when my ball won’t go around those damned loops and when my son beats me. It’s not fun to see a 7-year-old gloat over a hole in one while I try to fish my ball out of a water trap. 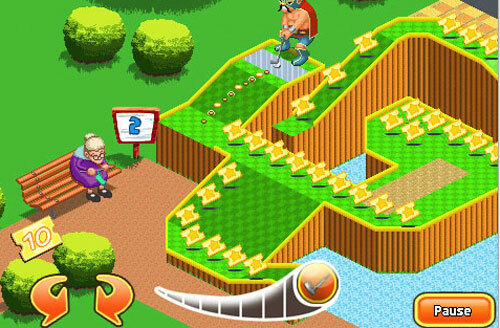 Digital Chocolate has announced a new iPhone game called Mini Golf 99 Holes Theme Park that is available on the App store now for $5.99. The game offers 99 different holes and four different courses to choose from. Each course has different obstacles to challenge players including spring jumps, teleportation pads, and bumpers. Players can choose from five different characters to play each with their own special powers like ball brake and more. The screens for the game look like graphics are good and I controls will be motion based. I love to play Mini Golf and now it is available on iPhone, that's great!